State Board/Commission/Council: Minnesota Commission on the Problems of Mentally Retarded, Handicapped and Gifted Children; 19?? to 196? County Board/Commissioner: Cottonwood County, Minnesota (County Welfare Board Member); 195? to 19?? 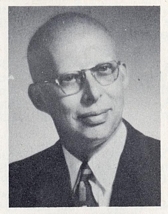 He ran unsuccessfully for the Minnesota Senate in the 1970 election. He was a member of the Rotary Club. He died from complications due to kidney failure and leukemia, at Good Samaritan Village in Mountain Lake, Minnesota. He was a member of Bethel Mennonite Church in Mountain Lake, Minnesota. Religion provided by his obituary. "Walt Franz Dies at 77 (Obituary)." Mountain Lake-Butterfield Observer/Advocate, January 23, 1985. Neufeld, Gordie. "As We Remember... (Obituary)." Mountain Lake-Butterfield Observer/Advocate, January 23, 1985. "Franz Was a Friend (Obituary)." Mankato Free Press, January 22, 1985; Mountain Lake-Butterfield Observer/Advocate, January 30, 1985. "Rites Set in Mountain Lake for Ex-Senator Walter Franz (Obituary)." St. Paul Pioneer Press, January 22, 1985. "Franz May Be Pro Tem Leader in State Senate." Minneapolis Tribune, January 7, 1969. W.J. Franz Profile, Source Unknown, 1957?